March 10th, 2011 August 29th, 2018 UnaXComments are off for this post. After growing a bit tired of the regular Gnome interface I thought that I would spice it all up by trying to ad a dock to hold all my launchers and such. This made me go search for all kinds of different possibilities and as always the Ubuntu Forums is a great place to start looking for something. Never have I met a community which is so friendly and eager to help when you have some trouble with a component or maybe need advise to figure out what you should do. After hunting around, I came up with three different alternatives I would try Docky, AWN and CairoDock. At first I had problems with getting more than one dock in AWN, which I really couldn’t understand. I had seen several nice screenshots of other peoples user interfaces and they had somehow managed to get it done, but no matter what I did in the settings, I just couldn’t figure out what to do. After some searching however, I did manage to find a post that gave me the possibility to do exactly what I wanted. I did however mean that I had to make sure that I got rid of the old installation of AWN, as it wasn’t available in the regular Ubuntu repositories. You need to use the AWN from the AWN-testing PPA. This removes the core packages that AWN is using and by adding the ‘sudo apt-get autoremove’ you remove all the unused dependencies too, so you don’t have any unused packages that might conflict when you are going to install the AWN trunk. With this last install, we now got everything we can to start playing around with AWN. Simply start up Avant Window Navigator from your menu by clicking ‘Applications’ -> ‘Accessories’ -> ‘Avant Window Navigator’. This gives you a standard bar, with a few things on it. 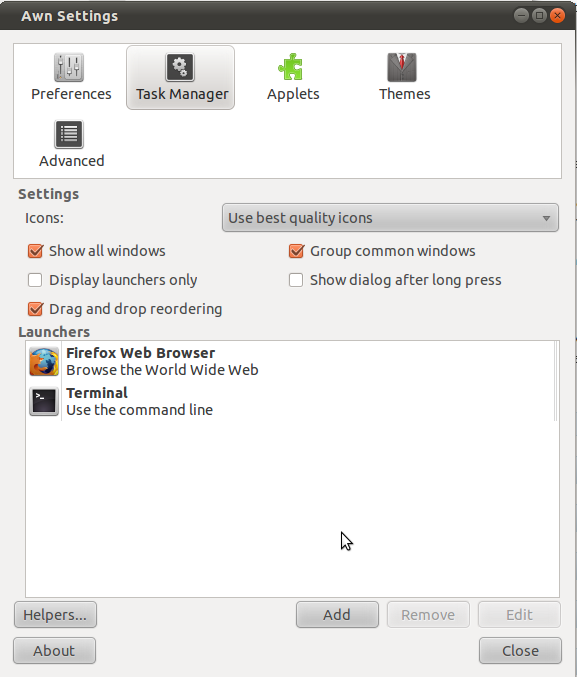 The standard launchers you’ll have is the AWN control panel, a terminal, Firefox and Rythmbox. It is here you make the action that is setting up AWN to your needs. You can chose all the usual things that are available for such an application, amongst others the size of the icons, the orientation of the bar (do you want the dock in the bottom, the top or maybe even on the side? 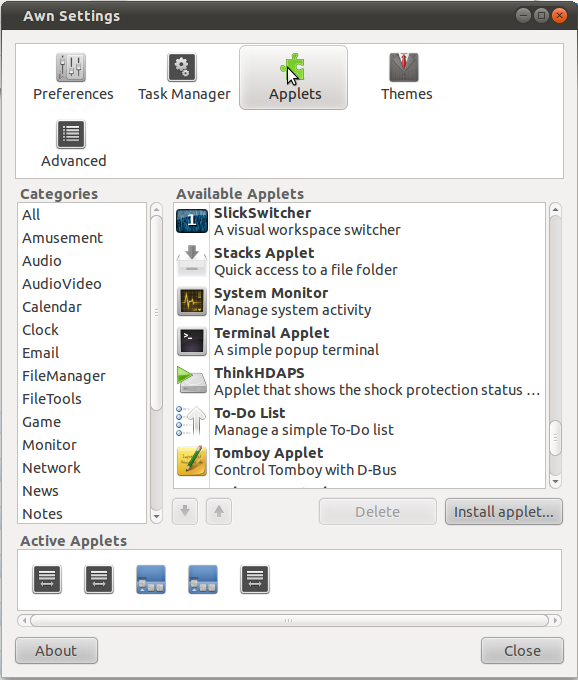 ), the style of how the dock acts and so on. 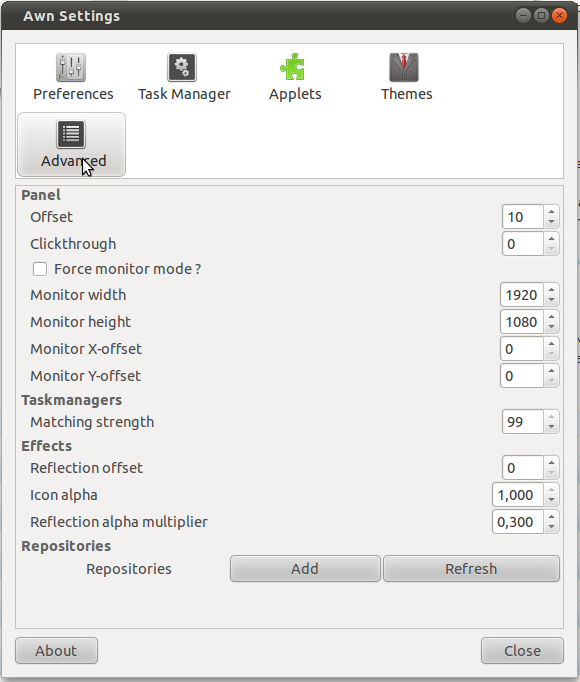 It is also here that you decide what helpers and applets that you want to run on your docks. As I mentioned it’s not very interesting, but the only thing I do from this is launch applications and swap between them and as you can see I’m still in the progress of setting them up. Thus, I’ve not gotten very far with it, but I’m still working on it and I will show you the progress in a later post when I’ve made my final decision on what dock to run. That is my current set-up after playing with AWN for 30 minutes time (not counting all the time it took me to find out that I needed the AWN-testing PPA) and as you can see it’s all very basic and simple so far. It will probably evolve later on when I’ve gotten more comfortable with it, but I think it’s rather simple to find the helpers I’ve needed for now. I can’t yet tell how hard it is to find special applets and helpers yet, but I will chime in when I know. 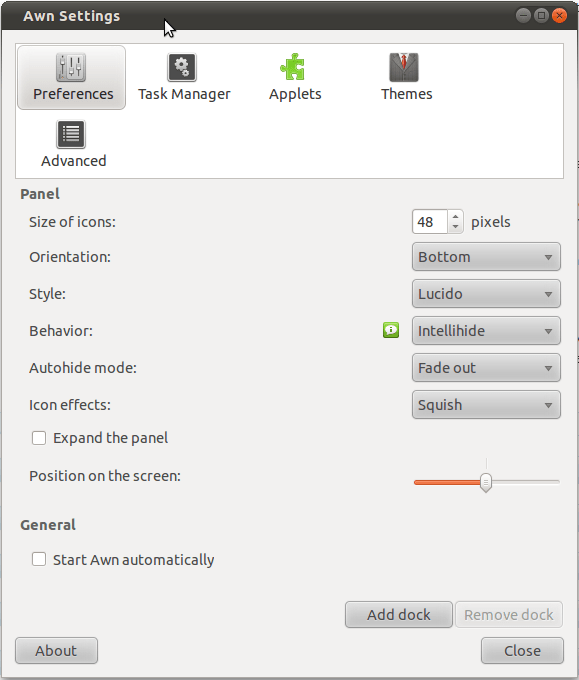 I hope this could answer a few questions on how to play around with AWN and start your own journey into nice docks in Ubuntu. Feel free to comment, point me towards better alternatives or what not, as I’m always open to some constructive criticism and suggestions.